Despite its high prevalence among active individuals9–12 and frequent presentations for treatment, there are few published guidelines to help clinicians choose the appropriate evidence-based treatment for patellofemoral pain. The most recent and relevant paper from Barton and colleagues13 combined systematic review findings with qualitative interviews from expert clinicians to provide a clinically relevant synthesis, covering the literature up to September 2013. At the International Patellofemoral Pain Research Retreat in Manchester 2015, we held a consensus meeting to update the current evidence base and produce consensus-based recommendations regarding treatment for patellofemoral pain. All retreat registrants were active researchers in patellofemoral pain and presented their research findings. Many of the world leading researchers (eg, 8 out of the top 10 researchers with the highest number of publications, when the term ‘patellofemoral pain’ was searched in Scopus, February 2016) were in attendance and contributed to the consensus meeting. The consensus meeting during the retreat resulted in recommendations, based on evidence published between January 2010 and June 2015. These recommendations should be combined with information gathered from individual patients, regarding their preferences, experiences, presentation and values, along with the values, expertise and skills of individual practitioners to create a patient-centred treatment approach. CJB searched EMBASE, MEDLINE, CINAHL and Current Contents for systematic reviews and randomised controlled trials (RCTs) published between January 2010 and June 2015. To be eligible, publications were (i) the most current systematic reviews including meta-analyses and (ii) any RCTs published subsequent to the most recent systematic review. Search terms used to search titles and abstracts of papers relating to patellofemoral pain in each database were (patella or patellofemoral) and (pain or syndrome or dysfunction).13 To narrow the search to identify systematic reviews, these diagnostic terms were combined with the keyword review. To narrow the search to identify any contemporary randomised trials, diagnostic terms were combined with (controlled trial or clinical trial) and additional searching was completed in the Physiotherapy Evidence Database (PEDro). Additionally, all authors on this consensus statement were consulted to identify any missing papers. To be included, randomised trials were required to evaluate one or more conservative intervention compared with a control or alternative conservative intervention, using an outcome measure related to pain (eg, pain visual analogue scale (VAS)) or patient-reported improvement, and using a randomised method for group allocation. Data were extracted from each included paper. Where multiple systematic reviews were available for the same intervention from the same time period, findings from moderate–high quality reviews were used in preference to low-quality reviews. If no systematic reviews were available, all published RCTs related to the intervention were included. Findings from included reviews and trials were used to generate a summary table, which included study methodology, relevant outcomes and effect sizes. The methodological quality of meta-analyses and systematic reviews was graded with the Assessment of Multiple Systematic Reviews (AMSTAR) tool; and RCTs were graded with the PEDro rating scale. Rating was completed by two independent reviewers (CJB and MvM), and discrepancies resolved through a consensus meeting. A third reviewer (KMC) was available to settle any disagreement but was not required. The patellofemoral pain expert panel was composed of 35 of the 50 attendees at the 2015 International Patellofemoral Research Retreat (Manchester). All attendees were actively researching patellofemoral pain and included physiotherapists, doctors, podiatrists, biomechanists, epidemiologists and sports therapists. Literature summary tables were developed by the consensus group (KMC, MvM, MJC, NJC, MSR, CJB) and distributed to all panel members prior to the consensus meeting. The summaries contained the quality ratings and effect sizes. Duration of treatment effect was classified as follows: <6 months considered short term, between 6 and 12 months was medium term and >12 months considered long term, unless otherwise defined in the systematic review. Statements were generated by the consensus group regarding each intervention, which reflected the evidence, and with respect to the interventions’ effect on pain, function and overall symptomatic improvement (ie, global rating of change). The panel was instructed to vote on the appropriateness of each statement. The panel was instructed to integrate the evidence for each intervention with their expert opinions and knowledge in order to interpret the appropriateness of each intervention. At the Research Retreat, a 1-hour discussion of the summary tables (led by the consensus group) enabled clarification of the study elements, and finalisation of the statements. Following the discussion, panel members voted on the appropriateness of each intervention. A pooled score provided a median appropriateness score for each intervention. A score of 0–3 was considered ‘inappropriate’, 4–6 ‘uncertain’ and 7–9 ‘appropriate’. Final recommendations were made on interventions where the outcome was consistent between voting and the evidence associated with this statement. The initial literature search for systematic reviews yielded 586 citations. Following screening for eligibility, a total of 22 systematic reviews were identified. Consultation with consensus authors did not yield any additional reviews. The interventions were grouped into the following: (i) exercise therapy (with separate sections for exercise therapy targeting specific bodily regions, ie, knee or hip); (ii) combined interventions (combining two or more of exercise therapy, patellar taping, mobilisation or foot orthoses); (iii) foot orthoses (in-shoe orthotic devices); (iv) patellar taping and bracing and (v) other adjunctive interventions (eg, acupuncture, mobilisation, electrophysical agents). Some of the reviews covered several interventions. This included 13 (5 moderate; 1 high quality) reviews related to exercise therapy, 2 (1 moderate quality) related to combined interventions, 5 (3 moderate; 1 high quality) related to foot orthoses, 4 (2 moderate; 1 high quality) related to patellar taping and bracing, and 7 (2 moderate quality) related to other adjunctive interventions. AMSTAR ratings for each of these systematic reviews and the search date included in their methods are outlined in table 1. Subsequent searching for RCTs since 2010 revealed an additional 1631 citations. After taking into account the literature covered by included systematic reviews, 36 of these were considered for inclusion. Of these 36, an additional 7 randomised trials were identified. These included 1 on exercise therapy, 2 on combined interventions, 2 on foot orthoses, 1 on patellar taping and 1 on other adjunctive interventions. PEDro ratings for each of these trials are outlined in table 2. Twenty-four statements (separated into time points and primary outcomes) were voted on by the panel. Results of this and associated evidence are outlined in figures 1⇓⇓⇓⇓⇓–7, including 12 statements related to exercise therapy (figures 1⇓–3), 3 statements related to combined interventions (figure 4), 2 statements related to foot orthoses (figure 5), 4 statements related to patellar taping and bracing (figure 6) and 4 statements related to other adjunctive interventions (figure 7). Synthesis of current evidence with consensus voting and recommendations for exercise therapy. First quartile=left whisker; second quartile=yellow box; median=yellow and green box intersection; third quartile=green box; fourth quartile=right whisker. Synthesis of current evidence with consensus voting and recommendations for hip combined with knee targeted exercise therapy. First quartile=left whisker; second quartile=yellow box; median=yellow and green box intersection; third quartile=green box; fourth quartile=right whisker. Synthesis of current evidence with consensus voting and recommendations for hip targeted exercise therapy. First quartile=left whisker; second quartile=yellow box; median=yellow and green box intersection; third quartile=green box; fourth quartile=right whisker. Synthesis of current evidence with consensus voting and recommendations for combined interventions. First quartile=left whisker; second quartile=yellow box; median=yellow and green box intersection; third quartile=green box; fourth quartile=right whisker. RCT, randomised controlled trial. Synthesis of current evidence with consensus voting and recommendations for prefabricated foot orthoses. First quartile=left whisker; second quartile=yellow box; median=yellow and green box intersection; third quartile=green box; fourth quartile=right whisker. Synthesis of current evidence with consensus voting and recommendations for patellar taping and bracing. First quartile=left whisker; second quartile=yellow box; median=yellow and green box intersection; third quartile=green box; fourth quartile=right whisker. Synthesis of current evidence with consensus voting and recommendations for other adjunctive interventions. First quartile=left whisker; second quartile=yellow box; median=yellow and green box intersection; third quartile=green box; fourth quartile=right whisker. *Statement worded opposite for voting, that is, based on evidence (eg, does not improve pain). Exercise is recommended to reduce pain in the short, medium and long term, and improve function in the medium and long term. Combining hip and knee exercises is recommended to reduce pain and improve function in the short, medium and long term, and this combination should be used in preference to knee exercises alone. Combined interventions are recommended to reduce pain in adults with patellofemoral pain in the short and medium term. Patellofemoral, knee and lumbar mobilisations may not improve outcomes. Electrophysical agents may not improve outcomes. Exercise-therapy is recommended to reduce pain in the short, medium and long term, and improve function in the medium and long term. Patellofemoral, knee and lumbar mobilisations are not recommended. Our recommendations differ from those described in the ‘Best Practice Guide to Conservative Management of Patellofemoral Pain’.13 The best practice guide did not recommend exercise therapy as a stand-alone treatment, but recommended consideration of acupuncture, and provided no recommendations regarding treatments which may not improve outcomes. These differences likely reflect the qualitative input from clinicians in the paper.13 In contrast, the consensus voting that led to our recommendations involved some researchers who had a clinical role and some who did not. For example, it appears that clinicians have a stronger preference for combined interventions (using a combination of exercise therapy, targeting knee and hip musculature, patellofemoral taping, mobilisation and foot orthoses), which was a recommendation from our consensus, than for stand-alone treatments, such as exercise therapy. However, exercise therapy has been evaluated considerably within the scientific literature and remains a recommendation as a stand-alone treatment from our consensus based on the strength of evidence supporting it. In contrast, interventions such as acupuncture have very limited supporting evidence. Appropriateness of acupuncture was voted as uncertain, and hence was not recommended in the current consensus meeting. However, acupuncture is frequently used by clinicians who treat patellofemoral pain, and this highlights a nexus between evidence and practice which requires high-quality clinical trials. The consensus meeting has also made recommendations against interventions such as mobilisation and electrotherapy, which current evidence indicates are ineffective. The consensus meeting was also unable to make any recommendations related to patient education in isolation, due to a paucity of research in this area. Considering the perceived importance of providing patient education from clinicians,13 further research and development on patient education interventions is encouraged. 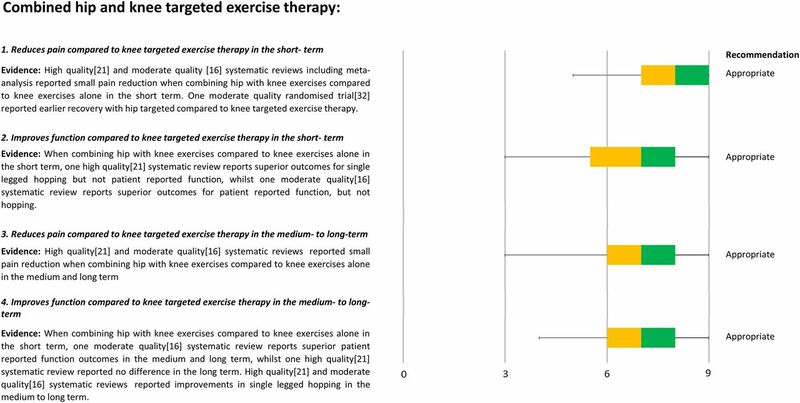 Exercise therapies had the most statements in support of their short-term, medium-term and long-term use, reflecting the large body of evidence underpinning this treatment. Exercise therapy was the only intervention tested in isolation to be supported by the expert group. The evidence clearly shows that exercise therapy is effective, regardless of the type of exercise (eg, in weight bearing or not; targeting hip or knee). There was also support for emerging but convincing evidence that combining a hip-focused with knee-focused exercise therapy regimen resulted in superior outcomes to isolated knee-focused exercise therapy. This is consistent with results from the combined intervention studies, which have included hip-focused and knee-focused exercise therapies. The uncertainty around the superiority of hip-focused when compared head-to-head with knee-focused treatments may reflect lack of clarity regarding implementation of targeted exercise therapies, and the potential for the reported exercise therapy regimens to truly only target either the hip or the knee. For example, knee-focused programmes including single-leg squatting or stair climbing activities will also target the hip, while standing exercises to target the hip with resistance will also involve a knee focus on the weight-bearing limb. The terms ‘exercise’ and ‘exercise therapy’ were discussed at length at the meeting. There is distinct lack of clarity regarding the taxonomy and reporting of exercise therapy treatments. Even when well reported, the type of exercise in the current evidence base varies with respect to the targets of the exercise (eg, strength, cardiovascular fitness, coordination/neuromuscular retraining).21 Furthermore, measurement of the effectiveness of such interventions to achieve their target, such as increasing strength, endurance and neuromuscular coordination, was rarely undertaken. Perhaps most importantly, the lack of detailed description of the exercise therapy interventions limits the translation of the research findings into clinical practice. This lack of reporting rigour for exercise therapy extends to other interventions described in this consensus statement. As a result of this discussion, a recommendation was made to adopt minimum reporting standards for patellofemoral pain studies, similar to those published for groin pain studies,45 and these standards are published by Morrisey et al. Whether patellar taping should be first-line treatment for patellofemoral pain was unclear to this expert panel. This conclusion was consistent with the ‘Best Practice Guide’13 findings. Patellar taping approaches vary considerably with respect to the type and duration of taping, and the systematic reviews29–31 that synthesise these studies have dealt with the variability inconsistently. Lack of clarity from systematic reviews may partially explain the uncertainty around the consensus voting and associated recommendations to support patellar taping. Uncertainty around the recommendations for taping might also reflect that greater consideration of individual patient needs may be required. For example, in Barton et al's13 synthesis, the experts described that targeting the taping to suit individual patient presentations was an important consideration. Patellar taping and bracing could play a role in patellofemoral pain management in combination with other treatments (ie, as part of a combined intervention as described above), but their role in isolation is yet to be fully determined. Other adjunctive treatments, such as joint mobilisations (patella, knee, lumbar), and electrophysical agents were not recommended for use in patellofemoral pain. Our consensus on physical and exercise treatments for patellofemoral pain was limited to the treatments with evidence regarding their usefulness. The inclusion of evidence stemming from moderate-quality and high-quality systematic reviews means that not all potentially valuable interventions were covered. For example, while gait retraining shows emerging evidence supporting its use in patellofemoral pain,53 more rigorous research is required before it can be considered as a recommended intervention. Our consensus group recommended some future directions regarding interventions for patellofemoral pain. We recognised the need for minimum reporting standards for clinical research on patellofemoral pain, similar to that published for groin pain in athletes,45 which is being undertaken. We recommended that future trials should publish details of the intervention in sufficient detail to enable clinicians to apply these in clinical practice (possibly as supplementary files). We require greater understanding of potential mechanisms underpinning treatment effects. We recognise that there is uncertainty regarding the usefulness of subgroups,54 or individualised (clinical reasoning) approaches to optimise treatments. As with all exercise interventions, adherence is paramount, and methods to advance adherence are urgently needed. It is still unclear which specific pain pathways (local and central pain mechanisms) are primarily involved in patellofemoral pain, but it appears that central pain mechanisms may be altered in people with patellofemoral pain.55–57 This clearly indicates the need to evaluate non-mechanical interventions to address these factors in some individuals. We recommend future trials investigating interventions for patellofemoral pain across the lifespan (ie, adolescents and those with patellofemoral osteoarthritis). There was overarching support from the International Patellofemoral Pain Research Retreat for the Enhancing the QUality And Transparency Of health Research (EQUATOR) guidelines (http://www.equator-network.org) for reporting, and we encourage investigators to follow the appropriate reporting guideline in future patellofemoral pain publications. The consensus meeting at the 4th International Patellofemoral Pain Research Retreat (Manchester 2015) provided six recommendations for use in patients with patellofemoral pain: exercise therapy, particularly combining hip and knee exercises, combined interventions and foot orthoses. Patellofemoral, knee and lumbar mobilisations and electrophysical agents were not recommended. The 5th International Patellofemoral Pain Research Retreat is scheduled for Brisbane, Australia, July 2017.
. Computerised recording of visits to an outpatient sports clinic. Am J Sports Med 1987;15:79–85.
. The natural history of anterior knee pain in adolescents. J Bone Joint Surg Br 1985;67:36–8.
. An update for the conservative management of patellofemoral pain syndrome: a systematic review of the literature from 2000 to 2010. Int J Sports Phys Ther 2011;6:112–25.
. Comparison of exercise open kinetic chain and closed kinetic chain in the rehabilitation of patellofemoral dysfunction: an updated revision. Clin Med Diagn 2012;2:7–11.
. Proximal exercises are effective in treating patellofemoral pain syndrome: a systematic review. Int J Sports Phys Ther 2013;8:689–700.
. A systematic review of the effectiveness of Kinesio Taping—fact or fashion? Eur J Phys Rehabil Med 2013;49:699–709.
. Evaluation of electromyographic biofeedback for the quadriceps femoris: a systematic review. J Athl Train 2011;46:543–54.
. Natural history of anterior knee pain: a 14- to 20-year follow-up of nonoperative management. J Pediatr Orthop 1998;18:118–22. Sharing decision-making between patient and clinician: the next step in evidence-based practice for patellofemoral pain?